New book out: Buechler, S. and Hanson, A-M. S. (2015). A Political Ecology of Women, Water and Global Environmental Change. Routledge, London. This edited volume explores how a feminist political ecology framework can bring fresh insights to the study of rural and urban livelihoods dependent on vulnerable rivers, lakes, watersheds, wetlands and coastal environments. Bringing together political ecologists and feminist scholars from multiple disciplines, the book develops solution-oriented advances to theory, policy and planning to tackle the complexity of these global environmental changes. 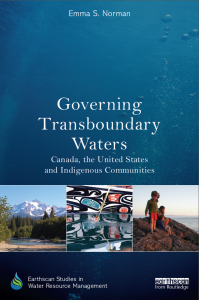 The text includes a foreword by Dr. Leila Harris. Bakker, K. and Allen, D. (2015). Canadian Water Security Assessment Framework: Tools for Assessing Water Security and Improving Watershed Governance (End-User Report). Waterloo, ON: Canadian Water Network. Bakker, K. (2014). The business of water: Market environmentalism in the water sector. Annual Review of Environment and Resources 39: 469-494. New book out: Harris, L., Goldin, J., Sneddon, C. (2013). 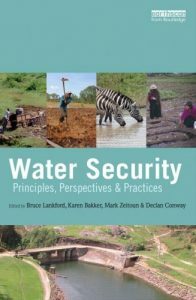 Contemporary Water Governance in the Global South: Scarcity, Marketization and Participation. Routledge, London. Order your copy here. Dunn, Gemma and Karen Bakker (2011). Fresh Water-Related Indicators in Canada: An Inventory and Analysis. Canadian Water Resources Journal Vol. 36(2): 135-148.